With the dawn of the digital age, cybersecurity has become ultra- important. Cases like Equifax and Target losing access to their customers’ private, personal data has business owners and IT managers scrambling to protect their companyʼs data. The University of Toledo Launchpad Incubation program will host an event to tackle this topic Thursday, March 21, at 11:30 a.m. in Nitschke Technology Commercialization Complex Room 2075. 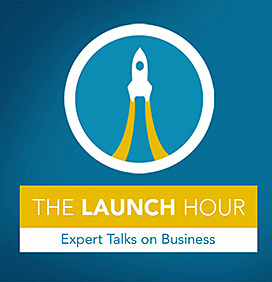 This program is part of Launchpad Incubationʼs Launch Hour series, a panel series where local experts share their business and specific experience to help business owners around the region. The panel will be moderated by Adam Salon, partner at JumpStart Inc. 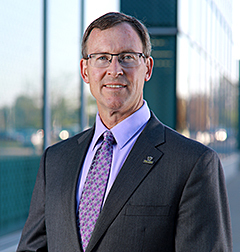 The LaunchPad Incubation Program at The University of Toledo is northwest Ohio’s premier business startup and entrepreneurial assistance program for innovative and high-tech companies. Housed at a renowned public research university, LaunchPad Incubation is a pioneer for business development in northwest Ohio and southeast Michigan. Register for the free event on the Launchpad Incubation website. For more information, call the Launchpad Incubation program at 419.530.3520. The University of Toledo Engineering Career Development Center will host the Spring 2019 Engineering Career Expo Wednesday, Feb. 27, from noon to 4 p.m. in the Thompson Student Union Auditorium. “This year continues to mark a milestone for the center: celebrating 20 years of placing more than 20,000 engineering co-ops,” Angie Gorny, director of the Engineering Career Development Center, said. More than 120 companies from across the United States and 700 engineering students, graduates and alumni will participate. Companies scheduled to have representatives on campus include Cooper Tire & Rubber Co., Dana Inc., GEM Inc., Johnson & Johnson — DePuy Synthes, GE Appliances, Honda, Matrix Service Co., Marathon Petroleum Corp., Owens Corning, Owens-Illinois Inc., PCC Airfoils, SSOE Group, and North Star Bluescope Steel LLC. The undergraduate mandatory co-op program is one of only eight mandatory engineering co-op programs in the country. 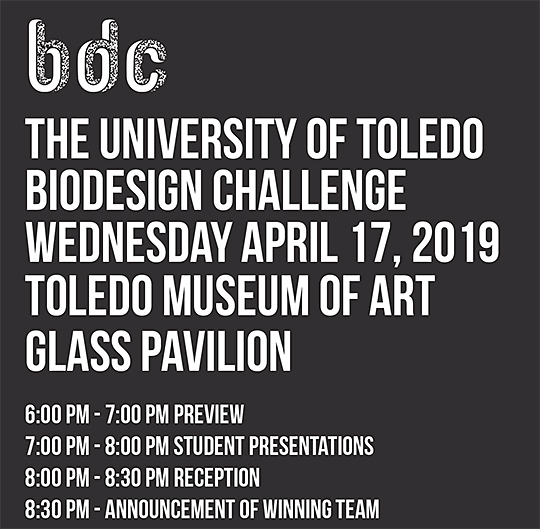 More information can be found on the UT College of Engineering Career Development website or by contacting Gorny at angela.gorny@utoledo.edu. Since she was a little girl growing up in Málaga, Spain, Dr. Ana C. Alba-Rubio brainstormed ways to motivate those around her to protect the planet. 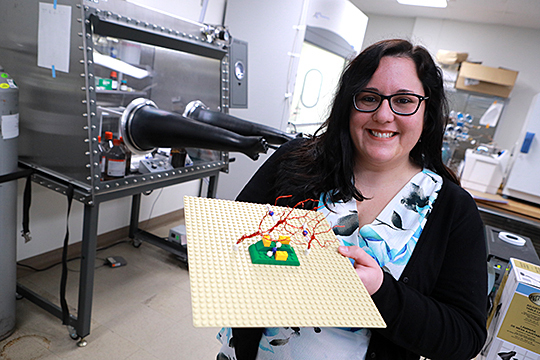 Dr. Ana C. Alba-Rubio, assistant professor of chemical engineering, holds a Lego model showing how the dual-function material would capture carbon dioxide and convert it into methanol and higher alcohols that could be fed into a fuel cell to produce electricity to power factories. Now an assistant professor of chemical engineering at The University of Toledo, she is pioneering a new method for factories to approach environmental stewardship and fight pollution with help from a five-year, $558,795 grant from the National Science Foundation. The Faculty Early Career Development award, known as CAREER, is one of the most prestigious awards in support of junior faculty who exemplify the role of teacher-scholars through the integration of research and education. Alba-Rubio is creating a dual-function material, which acts as an absorber and a catalyst, that could be placed at the top of industrial smokestacks as an alternative to current processes of capturing and sequestering carbon dioxide. The material would capture carbon dioxide and convert it into methanol and higher alcohols that could be fed into a fuel cell to produce electricity to power the plant. Alba-Rubio’s method would eliminate the energy requirement, corrosion and transportation issues associated with the processes currently used. Instead, the new material would transform carbon dioxide into a useful product on site. World carbon dioxide emissions have increased 55 percent in the last 20 years, according to the Global Carbon Project, including 2.7 percent from 2017 to 2018, the largest jump in seven years. As part of the grant-funded research, Alba-Rubio plans to engage students from elementary school to high school in her activities to expose them to chemical reactions and catalysis, as well as raise awareness of the effects of carbon dioxide on global warming. “As a Hispanic woman, I have a strong interest in increasing the participation of underrepresented groups in science, and I will continue providing hands-on experiences to migrant students in Ohio’s rural communities and other underrepresented students through the programs that The University of Toledo offers to Toledo Public Schools,” Alba-Rubio said. She is especially passionate about serving as a role model to encourage girls to pursue careers in science. Alba-Rubio is gathering support from other successful women across northwest Ohio in the fields of science, technology, engineering and mathematics to create a coloring book titled “Women Scientists Near You” to distribute to elementary schools throughout the region. Two events will bring more than 600 area students to The University of Toledo to celebrate Engineers Week. 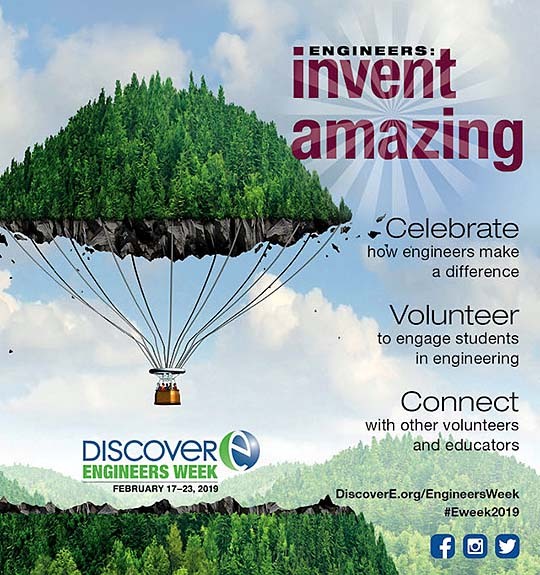 Founded in 1951, Engineers Week will be celebrated Feb. 17-23 and is dedicated to increasing understanding and interest in engineering and technology careers. Approximately 200 high school students from 24 districts will be on campus Tuesday, Feb. 19, to be an Engineer for a Day. They will arrive at 9 a.m. and watch a movie, “Dream Big,” in the Lois and Norman Nitschke Auditorium, and then learn about different careers during a tour of UT’s engineering facilities, and engage in hands-on activities with UT engineering students. After lunch, the high school students will shadow a professional engineer in the community. The UT College of Engineering also will host its second annual Introduce a Girl to Engineering Day. More than 450 sixth- through eighth-graders from 20 school districts will visit the University Thursday, Feb. 21, from 10 a.m. to 2 p.m. While on campus, the girls will tour the University’s engineering facilities, eat lunch with UT engineering students, and spend the afternoon participating in hands-on activities. For more information, contact Bosch at bryan.bosch@utoledo.edu. 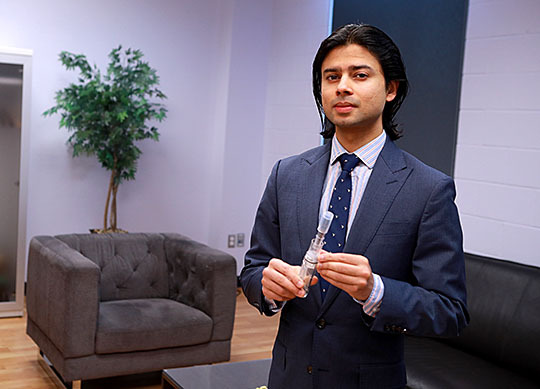 Dr. Aakash Agarwal, shown here holding a prepackaged surgical screw, has petitioned the FDA to revamp how screws used in spinal fusion sureries are handled to avoid contamination. Spinal fusion surgeries generally require four to six pedicle screws, but in the vast majority of procedures performed in the United States, surgeons begin with a tray containing 100 or more screws of different sizes to ensure the right size is immediately available within the operating room. Because so few implants are used in each procedure, most screws are washed and sterilized repeatedly with other contaminated instruments from the operating room before they are actually used during a surgery. But Agarwal said that isn’t practical or safe, and he’s calling on the Food and Drug Administration to ban the process in the United States. In a paper published in the Global Spine Journal, a team of experts led by Agarwal found screws that had been repeatedly reprocessed are harboring a number of contaminants, including corrosion, soap residue and organic tissue. The researchers recently submitted a formal petition along with their data to the FDA. Agarwal and his fellow researchers — which included Dr. Steven R. Garfin, interim dean of the University of California at San Diego School of Medicine, and Dr. Jeffrey C. Wang, co-director of the University of Southern California Spine Institute and president of North American Spine Society — presented evidence in a separate paper that individually sterile-packed screws also are picking up contaminants as they are handled in the operating room. The researchers devised a study in which two groups of individually packaged screws were used during live spine surgeries at multiple centers across the United States. One group of screws had a built-in intraoperative guard, while the other group did not have such a guard. The screws were prepared for insertion then sent away for analysis. That could potentially lead to infection and biofilm formation at the screw-bone interface. No microbial growth was detected on the screws that had integrated guards, which is meant to shield the screw itself from being exposed to air or touch while loading it onto the insertion device. The findings were published in Global Spine Journal and multiple conference proceedings. It also has been published by news media, including Becker’s Spine Review, Spinal News International, Orthopedic This Week and Orthopedics Today. Also involved in the research were Dr. Vijay Goel, Distinguished University Professor and Endowed Chair and McMaster-Gardner Professor of Orthopaedic Bioengineering at UT; Dr. Anand K. Agarwal, professor at UT’s Engineering Center for Orthopaedic Research Excellence; Dr. Hossein Elgafy, professor of orthopaedic surgery at UT; and Dr. Boren Lin, postdoctoral fellow at UT’s Engineering Center for Orthopaedic Research Excellence. Data on surgical site infections following spine surgery varies, but a recent randomized trial from Mount Sinai Beth Israel hospital in New York found a 12.7 percent incidence rate. Agarwal said that could represent up to 100,000 patients suffering from surgical site infection in the United States alone. “We shouldn’t be knowingly putting bacteria and other contaminates inside a patient’s body. With the disclosure of these evidences, it would be impossible to not undertake necessary safety measures,” Agarwal said. In addition to his faculty appointment at UT, Agarwal is the director of research and development for Spinal Balance, a private company that was founded in 2013 by a group of UT research professors. The firm, with its corporate office at the UT LaunchPad Incubation building, was created in part to address the problem of surgical site infection stemming from contaminated implants. Agarwal also was recently appointed to the editorial board of the Clinical Spine Surgery journal by Lippincott Williams & Wilkins for his contribution toward original research and peer reviews in the spine field. Created by Dr. Sarit Bhaduri, UT Distinguished University Professor of Mechanical, Industrial and Manufacturing Engineering, NovoGro is a moldable bone substitute putty used to fill gaps in bone and encourage new bone growth. It is used primarily in complicated fractures that would not otherwise heal properly on their own. Dr. Sarit Bhaduri, center, held the R&D Magazine award he received for NovoGro, a synthetic bone graft substitute he created with Dr. Anand Agarwal, left, and Dr. Vijay K. Goel. R&D Magazine named their invention as one of the year’s most exceptional innovations in science and technology. R&D Magazine has annually selected the top 100 revolutionary technologies of the past year since 1963. Among this year’s other winners were Dow Chemical, Texas Instruments, the MIT Lincoln Laboratory, Oak Ridge National Laboratory and NASA’s Glenn Research Center. 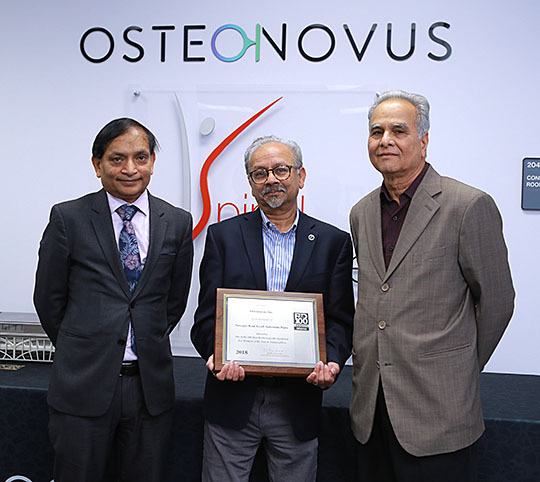 Bhaduri teamed up with Dr. Vijay K. Goel, UT Distinguished University Professor and Endowed Chair and McMaster-Gardner Professor of Orthopaedic Bioengineering, and Dr. Anand Agarwal, UT research professor of bioengineering, to license the technology from the University and co-found the biomedical firm OsteoNovus Inc. Agarwal also serves as the president and chief executive officer of OsteoNovus, where the product has undergone further development. The U.S. Food and Drug Administration has cleared NovoGro for use in two different indications — spine and the extremities. Currently, NovoGro has a half dozen clinical users across the country and is trying to grow the client base significantly in 2019. The company’s corporate offices and manufacturing facility are housed within The University of Toledo LaunchPad Incubation Program. A team of engineers at The University of Toledo created a new procedure and design software to more accurately estimate the structural capacity of existing pavement that could save the Ohio Department of Transportation millions of dollars on road improvement projects and be adopted by states across the country. 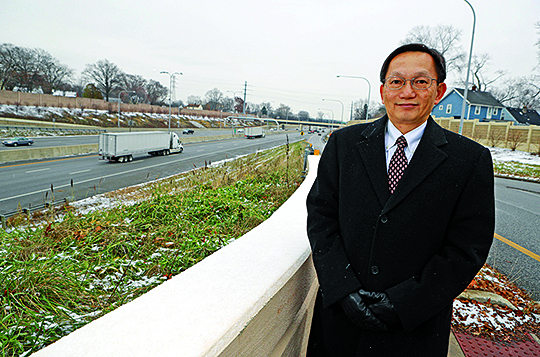 Dr. Eddie Chou is leading a team of UT engineers that designed software to estimate the structural capacity of existing pavement that could save the Ohio Department of Transportation millions of dollars on road improvement projects. The Transportation Research Board, a unit of the National Academies of Sciences, Engineering and Medicine, selected UT’s project for developing a revised pavement overlay thickness design procedure as one of 32 High-Value Research projects nationwide to be highlighted at its annual meeting Jan. 13-17 in Washington, D.C. The meeting attracts 13,000 transportation professionals from around the world. The new method is specifically designed for composite pavement — concrete pavement already topped with a thick layer of asphalt — which accounts for the majority of ODOT’s four-lane and interstate highways. Previously, ODOT used a design method that was originally developed for rigid, concrete pavements that tended to produce designs often deemed too thick and wasteful for today’s roadways, as pavement becomes thicker with each additional overlay. For an update, ODOT turned to the engineer who crafted the original design 25 years ago: Dr. Eddie Chou, UT professor of civil and environmental engineering, and director of the Transportation Systems Research Lab. The UT research team adopted a three-layer model for back-calculating the properties of the soil subgrade and pavement layers, instead of the old two-layer model that combined cement and asphalt into one. Chou said the new design reduces on average about five inches of overlay thickness, and the reduction of each additional inch of overlay can save approximately $120,000 per mile. “In addition to being more environmentally friendly, the potential cost savings can be substantial considering each year ODOT rehabilitates several hundred miles of existing composite pavements by laying additional asphalt on top,” Chou said. The revised design procedure was implemented into design software that adopts the improved back-calculation model. The software also offers an optional feature that takes into consideration the effects of temperature. The Ohio Department of Transportation and Federal Highway Administration sponsored the UT research.